The EGO POWER+ String Trimmer sets a new standard for string trimmers, performing as well as or better than premium petrol-powered models. It runs on the industry’s first-ever 56-volt Lithium-Ion battery, with 40% more power than the leading 40-volt battery. The bike handled line trimmer with Rapid Reload head for comfortable use and easy line loading. The machine also has a brushless motor that increases power and efficiency. The variable speed trigger allows for more precise working. 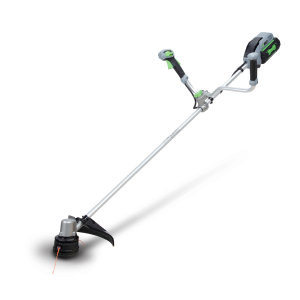 The EGO POWER+ String Trimmer delivers the performance of petrol without the noise, fuss, and fumes.